Binoculars make wildlife viewing much more fun. That stirring in the distant brush might turn out to be a bull caribou with a candelabra rack. The reddish blob on a salmonberry branch becomes an iridescent rufous hummingbird. Have binoculars for every member of your party, know how to use them, and keep them handy at all times. When wildlife makes its appearance you can be watching instead of fumbling or waiting your turn. Always use your binocular neck strap so the binoculars are safe around your neck and against your chest, within easy reach of your hands. 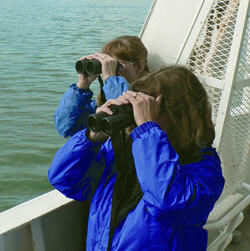 Some birders prefer to use a binocular harness, which uses straps over the shoulders and across the back to distribute the weight of the binoculars. The adjustable eyecups keep your eyes the right distance from the lenses. If you wear glasses, keep them on when using your binoculars. The eyecups should be folded or twisted down. If you don’t wear glasses, keep the eyecups extended. Adjust the binoculars at the hinge so that the two circles you see merge into one when looking through both lenses. For children and adults with smaller size heads, some binoculars may not adjust close enough. Try others. The most useful binoculars for bird watching incorporate a central focus wheel and a diopter focus adjustment. The diopter is often part of the right-hand eyepiece on a binocular. The purpose of the diopter is to compensate for the differences between your two eyes (because no two eyes are the same or have the same ability to focus.) Adjusting both the diopter focus and the central focus is how you get the clearest possible image from your binocular. Make sure the binoculars are the right width for your eyes, then find something to focus on, such as a tree branch against the sky or an overhead wire. Focus with both eyes open by turning the central focus wheel. To fine tune your focus, close your right eye and, using only your left eye, adjust the focus wheel. Next, close your left eye and, using the diopter adjustment, bring your view into sharp focus. Now open both eyes and check your focus. If the image is not crystal clear, repeat these steps, making small adjustments. Without the binoculars look for a spot in the distance and lock your eyes onto it. Don’t remove your eyes from the spot while you bring the binoculars up to your eyes and into alignment. With practice, this will become second nature and help even when a bird is in flight. It’s also helpful when you are locking your eyes on a bird to note some other nearby feature in the landscape at the same time. This will give you another reference point when you raise your binoculars. Clean your binoculars regularly and be careful not to damage the lenses in the process. Wiping them with your shirtsleeve might put lots of tiny scratches on the glass or lens coatings. The best way to clean your optics is to start with a soft brush or compressed air and blow away any dust or dirt. Dampen a lens cloth or lens tissue with a special cleaning solution for lenses then softly wipe the lenses. Dry them with a portion of the dry cloth. Look for smudges and repeat as needed. When shopping for binoculars, you’ll see them described with a pair of numbers, such as 7x35 or 8x24. The first number is the magnification - the bigger the number, the closer the subject will appear. Powers above 10 are difficult to hold steady. The second number is the diameter of the aperture lens. A bigger lens lets in more light, but is heavier. Birders prefer binoculars with a ratio of at least 1:5, which allow more light to see colors and details; however, compact binoculars are handy for travel. You can get decent binoculars for under $200. Invest more in good quality waterproof binoculars if you can afford them. Spotting scopes (small telescopes) provide higher magnification and greater light-gathering properties than binoculars, expanding the effective range of your viewing. Because scopes are affixed to tripods, once set up and focused on an animal, a group can take turns looking. This is great for younger children and reduces the frustrations of finding animals. A basic scope and tripod setup can be purchased for around $200.